You know the drill: It’s after lunch and you’re crashing, but you need to get through the rest of the afternoon. Finish work, run errands, pick up the kids, prepare dinner... clearly you need a pick-me-up. Feeling like there’s no other choice, you stop at the store for a soda or an energy drink. Even though you know it’s moving you further away from your ideal shape, this is becoming a daily ritual. Switching to "diet" sodas and energy drinks probably hasn't helped. With all that carbonation, sodium, and weird chemicals (mold inhibitors?! ), research* shows that people who choose these beverages almost never achieve weight loss. So how are you supposed to get your daily boost and lose weight? This is where IdealBoost comes in. Our delicious weight loss drink mix is low-calorie, sugar-free, and gives you more energy with a blend of green tea and caffeine. In addition to the metabolism-boosting benefits of caffeine and green tea, IdealBoost contains our signature hunger-blocker, Slendesta, to give you up to three hours of appetite control, making it the perfect weight loss drink. IdealBoost is a great addition to the IdealPlan because it helps you conquer cravings between meals and accelerates your fat loss results. Enjoy a refreshing glass of IdealBoost at 11am and 2pm, or any other time you need a "boost." Check out the full benefits below! IdealBoost contains about the same amount of caffeine as a cup of coffee, but the real benefit is in the power combo of green tea and caffeine for fat loss. Caffeine anhydrous is a proven aid in boosting metabolism and helping the body convert fat into energy to be burnt off. Green tea is also a fat burning powerhouse that improves leptin levels. And raspberry ketone is a compound of red raspberries that’s exploding in popularity for its ability to regulate metabolism. Research*** has found that green tea-caffeine consumption can help you achieve reduced body weight, waist size, and body fat! Slendesta is an all-natural hunger blocker that helps you feel full for up to 3 hours, so that you stay in control of your cravings between meals. And for an extra boost, IdealBoost contains Fibersol, a soluble dietary fiber, to decrease hunger and aid in healthy digestion and regularity. Other “diet” drinks might come with a zero-calorie promise, but they don’t stop you from splurging on other calories throughout the day. In fact, those drinks can actually make cravings worse*! If you can’t control your calories and cravings, you can’t lose weight. End of story. We could all use a little immunity boost! IdealBoost contains vitamins B3, B6 and B12, which contribute to healthy cell function, improving everything from our skin to our metabolism to our mood. Vitamin B deficiencies can result in depression, high blood pressure, and cognitive impairment amongst other problems, so it’s essential to get more in our diets. Green tea provides extra immune support with antioxidant and anti-inflammatory properties to help the body fight disease. We understand the science of weight loss, and that’s why we created a drink that gives you a PROVEN weight loss solution. *Study 1: A new study conducted by researchers at the Johns Hopkins Bloomberg School of Public Health found that people who drank diet beverages actually gained weight. Why? Well, those weird ingredients we mentioned above don’t help, but here’s the real reason: people who drink diet beverages like Diet Coke actually eat more calories on average. **Study 2: Researchers at the University of Melbourne tested who would be more successful: those in a 36-week weight loss program, or those in a lower-calorie 12-week program. No surprise, the accelerated group started seeing results more quickly. What’s more, because they got results faster, they stayed motivated. Those with the faster weight loss “boost” were more likely to reach their target weight! ***Study 3: In an investigation at Maastricht University, overweight and moderately obese subjects were split into two groups. One received a placebo, while the other received a green tea-caffeine mixture. After four weeks, the consistent green tea-caffeine drinkers experienced reduced body weight, waist size, and body fat. The placebo group didn’t get the same benefits. 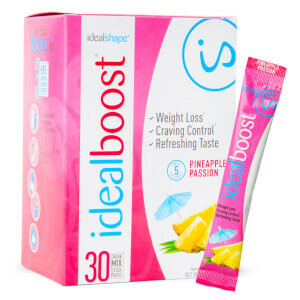 IdealBoost is more than a “water enhancer.” Those “weight loss drinks” are just flavoring, maybe with an energy zing if you’re lucky (and more likely, it’s just a sugar rush). None have the hunger-blocking and fat-burning benefits of IdealBoost. In convenient individual stick packs, you can enjoy a glass of IdealBoost anywhere, anytime you want. Each box of 30 packets will last you 2-4 weeks. Any time you need a boost, grab a stick from your bag, add water, and let the perfect blend of ingredients go to work for you! Curb your appetite and replace your sodas and energy drinks… all for under $1.50 per drink! How much caffeine is in IdealBoost? 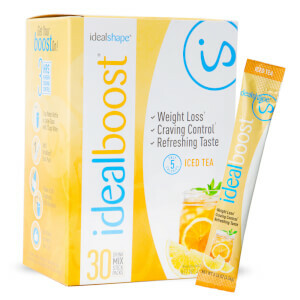 Each serving of IdealBoost contains 80 mg of caffeine, mostly from green tea and green coffee bean extract. This equals a roughly the same amount of caffeine as a cup of coffee. How much water do you mix the stick pack in? How long does IdealBoost suppress your appetite? How does IdealBoost fit into the IdealPlan? IdealBoost is a great addition to the IdealPlan, which consists of five small daily meals including two IdealShakes and an IdealBar. 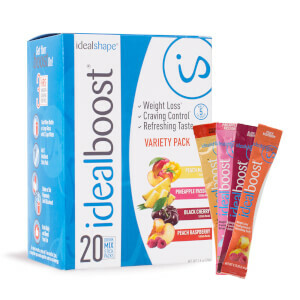 IdealBoost provides energy and appetite control, so it's a perfect "boost" between meals. It can also help you replace higher calorie beverages that have been holding you back from achieving your weight loss goals. We see IdealBoost most used at 10am and 2pm. How does IdealBoost help you lose weight? 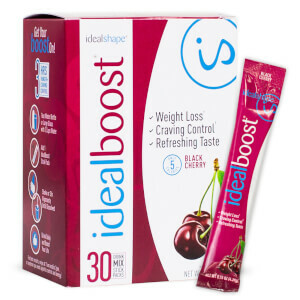 IdealBoost contains powerful ingredients that have been researched and shown to aid in weight loss. Green coffee bean is a fat burning powerhouse because of the extremely high concentration of chlorogenic acid. Green tea also contains naturally occurring polyphenols and caffeine to stimulate fat burning. Slendesta is an appetite suppressant that keeps you full for up to 3 hours. With the power to control your hunger and boost your metabolism, it's a great aid in fat weight loss.